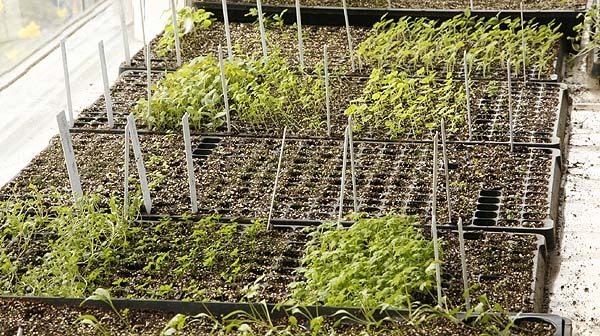 12 Reasons to buy seed to start your plants this year. Don’t leave it too late to buy your seeds. 1. You get a jump on winter. Instead of waiting until the weather is warm enough to sow our seeds outside we start them during the winter months inside so they are large and hopefully health by time its warm enough to plant them out. So we get larger plants sooner, our gardens have flowers faster and our vegetables are available much earlier. 2. 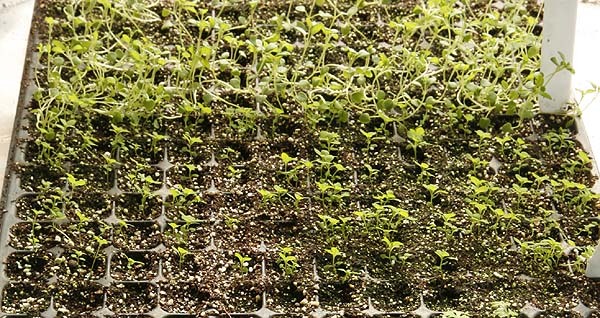 Growing inside in trays gives you complete control over the conditions in which the seeds germinate. Sown outside the seeds have to take their chances that the conditions are right. Inside you have a much higher rate of success and thus more plants than hoping nature will give you what you want. So you get more plants for your money. 3. 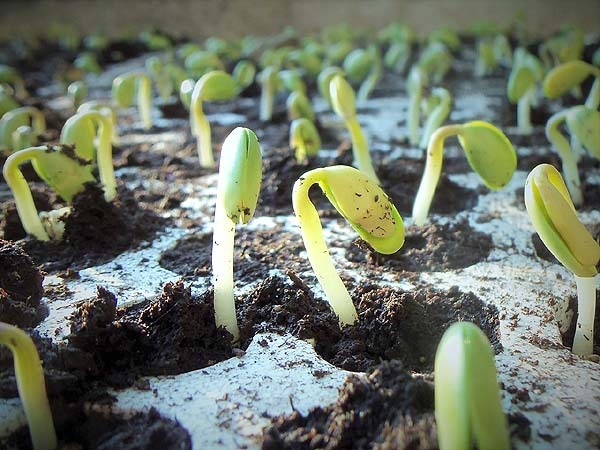 Many seedlings are small and grow slowly at first. This is far more common with perennial plants than annuals so starting early and giving the plants a good start nursing them to a reasonable size before putting them into the ground gives them a much better chance at survival, it also ensures that they don’t have to complete with a lot of weeds in that first important stage of their lives. 4. You get so much more for your money. A packet of seeds is not expensive it may seem like a lot when you look at those little seeds in the packet, but each one of those little seeds is a potential plant. That ends up as a LOT of plants! A packet of seeds may cost perhaps $2.00 – $4.00 which will give you anywhere from 30 to 200 seeds. A pack of plants in the garden center could cost the same amount of money but you only get 2-6 plants at the most. 5. Beats out the weeds in one of two ways. If you sow seeds early inside then the plants you grow don’t have to compete with weeds as they would if they were direct sown. This gives them a wonderful advantage. Annual flower plants can be planted closer together to form a solid mass of plant cover for the summer months. This ensures that there is much less weeding since the weed seeds don’t have enough light to germinate. It’s a win win. 6. You have a lot more plants to work with. You can make huge displays of color or grow larger amounts of vegetables and make your garden the showpiece of the neighborhood. While your neighbours are buying a six pack or a flat of small flowering plants, for a fraction of that cost you have several dozen flats. This means you have a lot more plants to make a wonderful display of flowers, vegetables or whatever your choice all for a fraction of the cost. 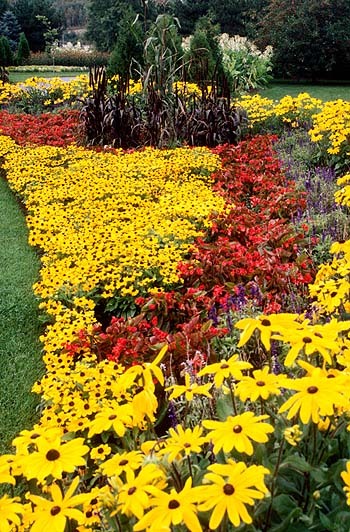 Creating mass plantings of flowers is easy an inexpensive. Mass plantings give great impact and can be inexpensively achieved by growing many plants from on packet of seeds. 7. You have back-up plants. If you buy a six pack at the garden center, come home, plant them and two or more die. Now you have to go back to the garden center to get more to fill in the spaces. If you grow seeds you can plant group of plants, see how well they do, and if some fail you have more on the sidelines waiting to fill in the spaces. A fail safe backup. Almost any commercial farm works this way. A few plants always die so backups are inserted in their place. 8. Get a lot more choice than your local garden center will offer you. They only have so much space so they can’t offer as wide a range of plants as you can grow from seed. They will sell what is popular and easy. Growing them yourself means you don’t have to have the same plants everyone else does you can have something new and different. You can stand out. 9. You can grow a lot of different plants and produce a much more diverse garden. Instead of just having a couple of flats of the usual plants from the garden center you can have a dozen or more different kinds of plants. You can choose ones that flower at different times or are different colors. 10. Growing plants from seed is a wonderful experience. Watching the little green shoots poke up through the soil and turn into large flowering or fruiting plants is amazing. It’s a great thing to do with children or all ages. It helps to link people to their origins and roots in the soil. 11. You can bring spring into the house early. While its still cold and wintery outside the little seedlings inside are coming up and promising an new beginning to the year. Fresh green shoots helps to take away the winter blues. So when its cold outside and the winter snows are falling and the wind blowing. This is the time to hunker down with the seed catalogs or check out the online sites to decide what plants you want to grow this year. Then buy them and start the seeds. If you want to get your jump on winter then you need to start looking at the seed options now. For best results seeds need to be started soon. For us here in the northeast mid to late February is the ideal time to start seeds. Therefore now is the time you need to buy them. Author Janice Hazeldine PhDPosted on February 23, 2017 February 17, 2017 Categories Garden work, plants, things to doTags buy seeds, buying your seeds, growing plants from seed, reasons to grow plants from seed, reasons to start seedsLeave a comment on 12 Reasons to buy seed to start your plants this year.